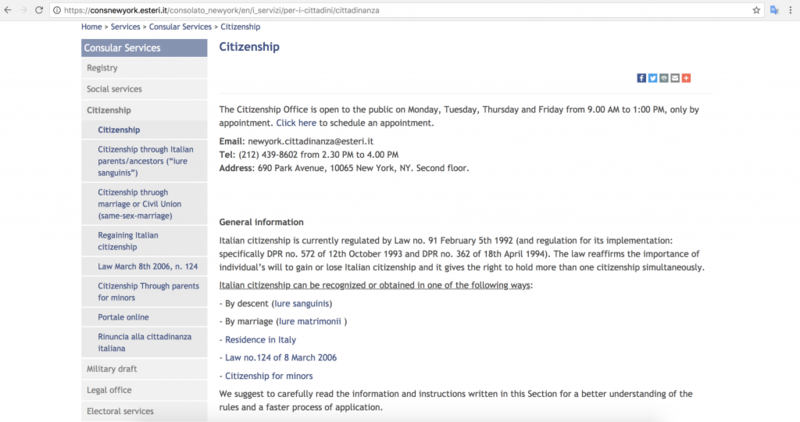 How to get Italian dual citizenship - Get Italian Citizenship | The Italian dual citizenship experts. I want to help everyone apply for dual citizenship and I think that if you qualify, you should not pass up the opportunity to get an Italian passport. If you want to apply for Italian citizenship jure sanguinis (also known as Italian dual citizenship), you want to approach the application methodically. Trust me, there’s a reason for this. Applying for Italian dual citizenship is like getting a crash course in graduate school Advanced Italian Bureaucracy, so the more organized you are, the better-equipped you’ll be to tackle the red tape. Being prepared from the beginning means you’ll be able to kung fu your way through anything thrown at you along the way (and believe me, some things will be thrown your way)! First things first, you want to make sure you qualify.The rules to qualifying are specific and very broad, so it is likely that you qualify. Most Italian Americans do! Second, you want to figure out what consulate you’ll apply to. In the United States, there are Italian consulates in Los Angeles, Detroit, Houston, Los Angeles, Miami, New York, Philadelphia, San Francisco, and one embassy in Washington, DC. Then, figure out the needed documents based on your consulate. All consular websites have pages for dual citizenship. It’s important to follow this information to a tee. Each consulate has different requirements despite them all referring to the same laws for Italian dual citizenship (I know, I think it’s silly too…), so what New York wants wouldn’t necessarily be what San Francisco does. Detroit is really chill on discrepancies, for example, while Boston isn’t. San Francisco gives appointments out 4-6 years in advance and LA is booking 10 years out while Houston is practically okay with walk ins. You get the idea. Plan accordingly! Work back from your last Italian-born ancestor’s birth certificate. This allows you to get your oldest document first, following the “chain” of vital records from your citizenship-giving ancestor back to you. Obtain your last Italian-born ancestor’s naturalization records first. Naturalization records can take the longest to obtain, so starting with them may be a good idea if you want to do everything in a timely way. Work off of any family documents you may have. This may work best for you if you already have some documents at home. This was how I did my own citizenship—my grandfather’s naturalization record was framed on the wall, and so I worked from that. Fifth, get good translations of your American documents done (shameless self-promotion: I have been a professional translator since 2003 and can take care of them for you). You’ll want a competent Italian translator who can work with legalese. These documents may seem easy but they’re not—I once had to correct the translation done by a non-pro. They wrote “informer” as “informatore” which is a mafia informer rather than someone who notifies an official body of a birth or death! Needless to say, you want to make sure that your translations will be handed in without a hitch. Here’s an apostille. If yours doesn’t look like this, don’t worry. Each state has their own special template. Side note: while your translations are being done (your translator can work off scans of the originals), you should be sending out your documents for apostilles. More information about what apostilles are and how to obtain them can be found here. Apostilles must be included on your documents if you want them to be accepted by the consulate. 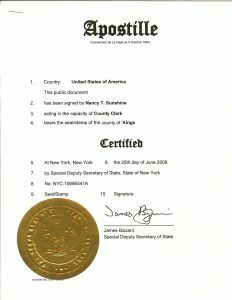 They’re basically a certification on top of a certification–the height of bureaucracy, but very much essential to your application.